It goes without saying that every single home would need its fair share of electrical devices, and some of these are indispensable – such as a refrigerator, a computer, and perhaps even a TV set. As for a blood pressure monitor, I hardly see manual versions any more, but technology has moved at such a pace that the blood pressure monitor has now taken a twist where it is not only electronic, but runs sans wires as well. We are referring to Withings’ Wireless Blood Pressure Monitor, of course, which was unveiled at the recently concluded CES 2014. The Wireless Blood Pressure Monitor happens to be a revamped version of its award-winning Smart Blood Pressure Monitor. 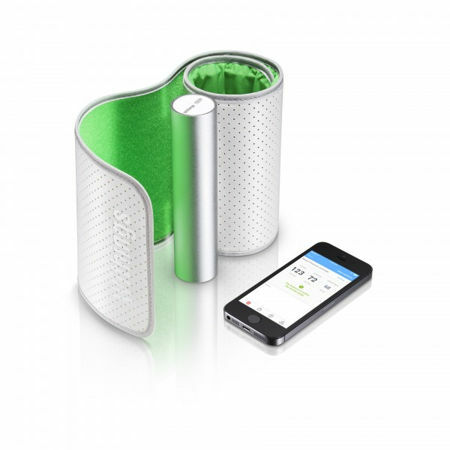 What has the folks at Withings done to improve this particular blood pressure monitor? They have decided to throw in wireless ability, in addition to making it play nice with Android-powered devices. Not only that, Withings intends to take its vision of user-friendly connected health another step further. Sporting a medically-approved blood pressure cuff, it makes it a whole lot easier to use, which would also drastically expand its reach. Withings makes life easier when it comes to taking measurements, where all that you need would be to wrap the cuff around their arm and turn it on. Once done, it will automatically hook up to your smartphone via Bluetooth, opening up the Withings Health Mate application. Tapping the start button, the cuff will inflate and starts to take down the wearer’s systolic, diastolic blood pressure in addition to heart rate. All results would be shown on the screen automatically, saved and compared to standards for better comprehension later on. The Withings Wireless Blood Pressure Monitor will offer a 360° well-being experience, where it will retail for $129.95 a pop. Would you be interested in picking this puppy up when available?